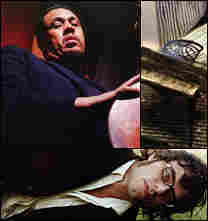 Charles Mingus with Eric Dolphy, Fats Domino, Thurston Moore : All Songs Considered Jazz legend Charles Mingus with Eric Dolphy; Rare recordings from Stephen Stills; Solo work by Sonic Youth's Thurston Moore. The hilarious Flight of the Conchords; A Swedish pop set with Sambassadeur; 1920s electronica: The Real Tuesday Weld; A new compilation showcasing Fats Domino; Jazz legend Charles Mingus with Eric Dolphy; Rare recordings from Stephen Stills; Solo work by Sonic Youth's Thurston Moore. We do not have the label's permission to play this cut by itself. You can hear it in the body of the full show with the link at the top of the page.